Sometimes when you go away you are really looking to just snuggle up. The Catskills region in upstate New York is just the place to do that. With plenty of historic B&Bs, locally sourced fare, vintage shops and cultural museums, there’s plenty to do in the small-town, big-mountain region that keeps it cozy – but never sleepy. The nucleus of your cozy trip is finding a snug place to rest your head and sleep in as late as you want. The Fairlawn Inn is a colorful, Victorian-style bed and breakfast that lives at the base of Hunter Mountain with pink-and-yellow verdant decor, themed bedrooms and an outdoor firepit. For a modern twist, The DeBruce in Livingston Manor is the only hotel that overlooks the Willowemoc Valley. Renovated from the 19th century, the B&B’s nightly rate includes breakfast and a seven or nine course gourmet dinner, providing a unique experience that makes you feel right at home. Additionally, there is a Great Room with views of the valley, and a Conservatory outfitted with the building’s original stone fireplace; not to mention the spa treatments they offer, plus yoga and fly fishing courses. All of these amenities makes for a memorable stay. The rustic chic North Branch Inn in North Branch is outfitted with an old wood stove and books lining the sitting room. There’s also a working 100-year-old bowling alley tucked away in the renovated 1868 house. 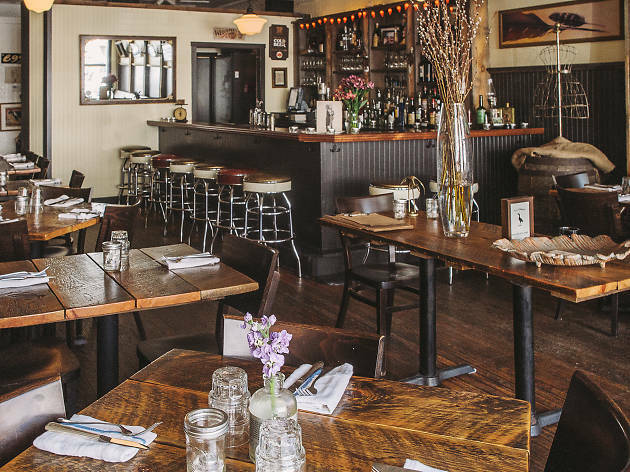 Once you decide to finally get out of bed—or uncurl from the couch—and head into town, hit up the neighborhood spots that are serving goods sourced directly from the local farms and gardens that dot the Catskills. Main Street Farm Market and Cafe in Livingston Manor serves as a grocery purveying local produce, while the cafe uses local ingredients in sandwiches, salads and soups. The Brandenburg Bakery, also in Livingston Manor, sells German baked goods, savory panini and croissants in a cute cafe run by owners straight from Germany. Enjoy a leisurely lunch at Table on Ten in Bloomville—known for their use of extraordinarily fresh and local ingredients—with a menu of sandwiches, salads and rotating, seasonal pizzas. If you’re a history buff and itching for a time-machine experience, the Thomas Cole National Historic Site in Catskill takes you back in time to the birth of the Hudson River School with examples of the art movement’s 19th-century landscape paintings on display. Rooms are set up to replicate what the residence looked like when Cole, the founder of the movement, worked there. Another cultural experience is the Museum at Bethel Woods Center for the Arts located where the original Woodstock Festival took place in Bethel. The museum showcases relics from the 1969 Woodstock Music and Art Fair and the whole revolutionary decade that preceded it. If you’re really itching to get outdoors, hike around Upper Delaware Scenic and Recreational River in Sullivan County. You can follow one of the six marked trails with views of the Upper Delaware River Valley, wetlands and old growth forests. Finish the hike and earn some extra cozy time back at your B&B. The Barryville farmer’s market has been around for more than a decade and currently includes 15 local vendors. Stroll around selecting goods from friendly businesses like Aaron Burr Cider, pastries from Cakes & Scones Bakery and beauty products from Mo’s Tonic. After that, head to the Barryville Antiques Emporium for vintage home goods. Shop the Buck Brook Alpacas Family Farm in Roscoe for sweaters, blankets and other cozy items (plus visit the adorable alpacas). Be sure to stop by One Grand Books in Narrowsburg, to pick up a good book to read under your new alpaca blanket. This small shop is full of celeb book recommendations (Tilda Swinton, John Lithgow and Bill Gates have all contributed). Wrap up your afternoon by picking your own produce–like apples or pumpkins–at Story Farms in Catskill. 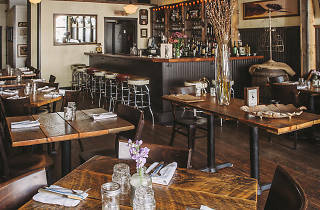 The Heron is a rustic dining room of a restaurant serving hearty new American fare from an NYC couple. On a nice night, sit outside and enjoy the Delaware River in Narrowsburg while noshing on deviled eggs and caramelized onion mac and cheese. With a slogan like, “local comfort crafted locally,” patrons know they are in for an unassuming yet delicious meal at Henning’s Local. The restaurant, located above the historic Heinle’s General Store, serves up simple and fresh fare. Even the menu keeps it straightforward with courses broken out by “start,” and “finish” as well as “fish” and “not fish” for the main courses. Rolling River Cafe in Parksville sources all its organic ingredients locally, offering Eastern European fare like Russian dumplings or “Putin’s Tears” (marinated herring) in a funky setting right on the Little Beaverkill River. Check out the art gallery on the premises while you’re there. Brushland Eating House in Bovina Center is reminiscent of the communal food spaces found in the 19th century, serving simple American dishes like burgers and cast-iron chicken in a handsome retro space with wood-paneled floors.